Over the weekend, Macon-Bibb saw its third homicide of the year, but there's another number that's rising. MACON, Ga. — In 2018, Macon-Bibb saw just over 40 homicides. Three-and-a-half months into 2019, we've only seen 3 people killed. While that rate may be dropping, there's another that's rising. Bibb County Chief Coroner, Leon Jones says 15 people committed suicide in Macon-Bibb last year, but 104 days into 2019, 11 people have already taken their own life. It's not just a local problem. Research from the Centers for Disease Control says over about the last 20 years, the nationwide suicide rate has increased by around 25 percent. "It's been a slow living nightmare." "I need my son here." "We were blindsided by it." "It's been very had to cope with. Time just doesn't help me." Those are just some of the ways that family and friends have described to 13WMAZ losing a loved one to suicide. Dr. Cesar Figueroa is the Medical Director at the Center for Behavioral Health at Coliseum Medical Center. "We know sometimes there's economic problems, isolation from the community, the rise of mental health problems, and, to an extent, technology," says Dr. Figueroa. In the first 3- and-a-half months of the year, there have also been several public suicides in Central Georgia. "I truly believe suicide in a public place is a statement," says Dr. Figueroa. In March, a customer shot himself inside the bathroom at a Warner Robins Cheddar's restaurant, and just last week, a veteran shot himself in the parking lot of the Dublin VA hospital. 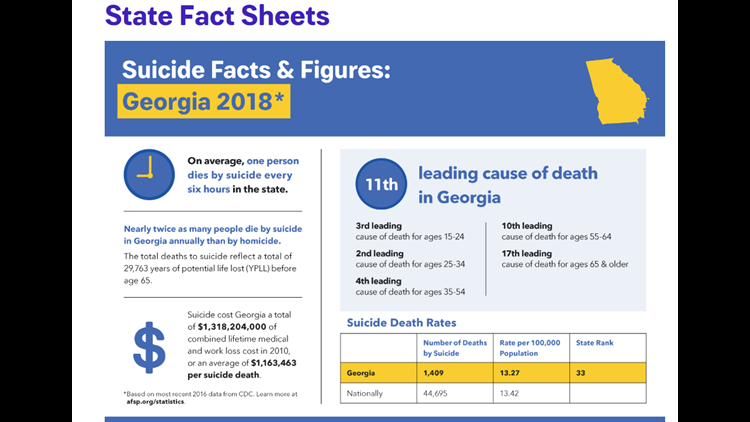 According to the American Foundation for Suicide Prevention, someone ends their life about once every six hours in Georgia. Unfortunately, when that happens, people like Macon-Bibb Coroner Leon Jones must alert their family. "It leaves the family in turmoil, and your family and friends are left wondering if there is something they could've done or could've said," says Jones. Dr. Figueroa says some research suggests when someone has a "true intent" to kill themselves, there's about a 20-minute window. He says if they have someone to call, like a friend, family, or doctor who can calm them down within that time, they will likely survive. If you or someone you know is having suicidal thoughts, you can call the National Suicide Prevention Lifeline at 1-800-273-8255.